All-Inclusive: Semi; Breakfast is included, meal plans covering lunch & dinner available. Accommodations: 24 Guestrooms, Suites,& Villas, all ocean front. Price Includes: Accommodations, room tax and service charge, airport transfers, breakfast (lunch/dinner plans available at additional cost), restaurant gratuities, two 1-hour dives daily. Note: dive staff gratuities are not included. 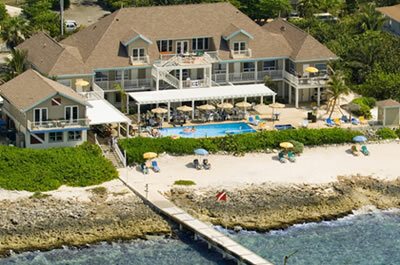 Cobalt Coast Dive Resort sits oceanfront and offers 24 Guestrooms, Suites & Villas featuring modern Caribbean elegance. Spacious air-conditioned accommodations, most of them with spectacular unobstructed views of the Caribbean Sea (your choice of 1 King or 2 Full-Size Beds), Cable TV, Refrigerator, Coffeemaker, direct-dial telephone with data port. One- & Two- bedroom suites with separate living rooms featuring coffee table & chairs, dining table and chairs, wet bar (sink) and queen sleeper sofa. Private two-bedroom and bathroom Garden Villas available with fully equipped kitchen, 2 bedrooms (1 king size bed and 2 full size beds) plus a queen sleeper in the separate living room as well as 2 bathrooms. All units feature a full bath, including hairdryers, iron and ironing board, in-room safe. Complimentary high-speed WiFi is available at the restaurnat & bar (laptop and wirelss card required). Cobalt Coast is primarily a Dive Resort, with unlimited shore diving and two 1-tank dives daily, however, there are many other activities to be found on Grand Cayman Island for non-divers, including shopping (with lots of duty-free shops), deep sea fishing, hiking, and much more. Duppies Restaurant features Caribbean/European cuisine and an intimate Bar with additional pool deck service for those spectacular sunset happy hours. Guests have discovered the value of their full meal plan option. The friendly staff at Cobalt Coast Resort serves full, fresh made-to-order breakfast, American style lunch and continental dinners, and they always have a daily special. Enjoying dinner on the pool deck sitting oceanfront is a great way to wind down after a full day of diving. Have the chef prepare your dinner just the way you like it. Many exciting sea food options, Black Angus beef, free range chicken and vegetarian choices are available.